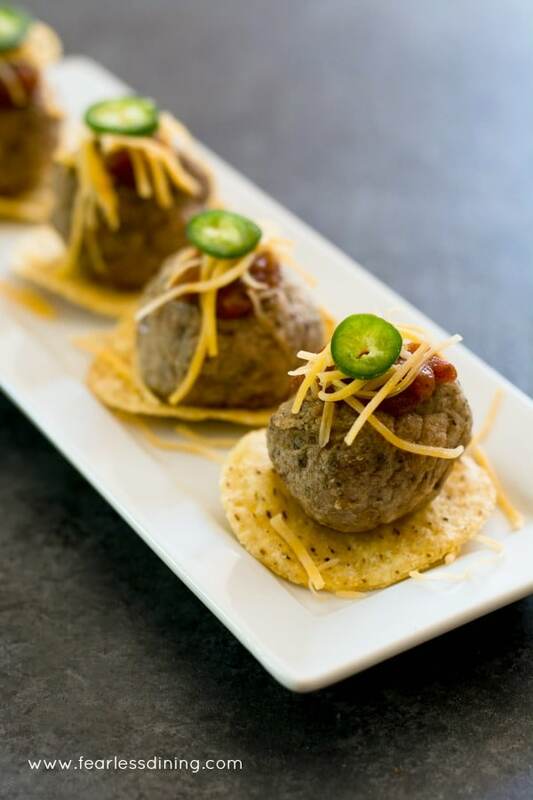 You are going to LOVE this easy new entertaining idea using frozen meatballs. 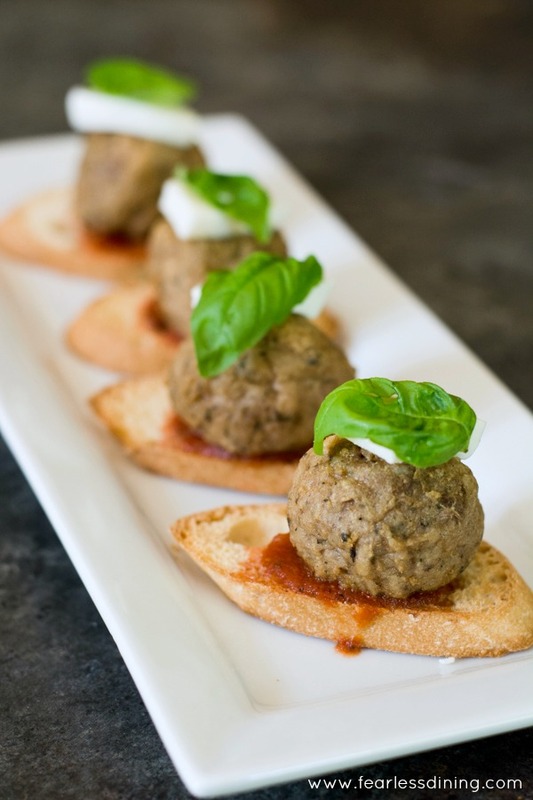 These frozen meatball appetizer recipes make entertaining SO easy! Four ways to enjoy healthy chicken meatballs. Can you believe you can have 4 different appetizers in just 15 minutes! 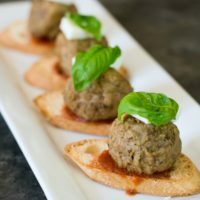 These quick and easy meatball appetizers are perfect for when people just drop by, or that special game day party! The holiday season is upon us and its the season of friends and entertaining. It is time to gather up those gluten free appetizer recipes! How about some healthy chicken meatballs? They make the best appetizers and party food! Imagine friends drop by out of the blue…what would you serve? I used to panic when this happened, and often ended up pulling out a bag of chips and served a bowl of salsa. Boring, right? Well, I am not worrying anymore because I have a secret weapon that allows me to get nutritious tasty appetizers out in under 15 minutes! Have you seen the new Coastal Range Organics chicken products in your grocery stores yet? You will love the gluten free meatball recipe ideas I created with these gluten free chicken meatballs. 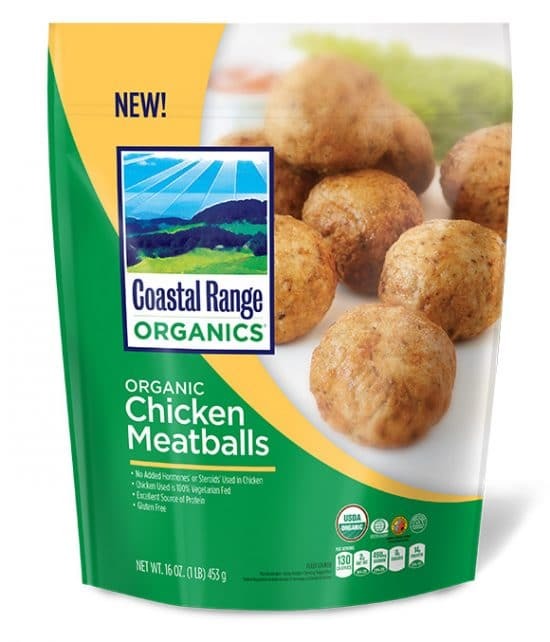 Coastal Range Organics chicken meatballs are frozen, so you can keep them in your freezer and have them on-hand for any occasion! Are you ready to check out all of the appetizers I made with a bag of meatballs? First up is my personal favorite. 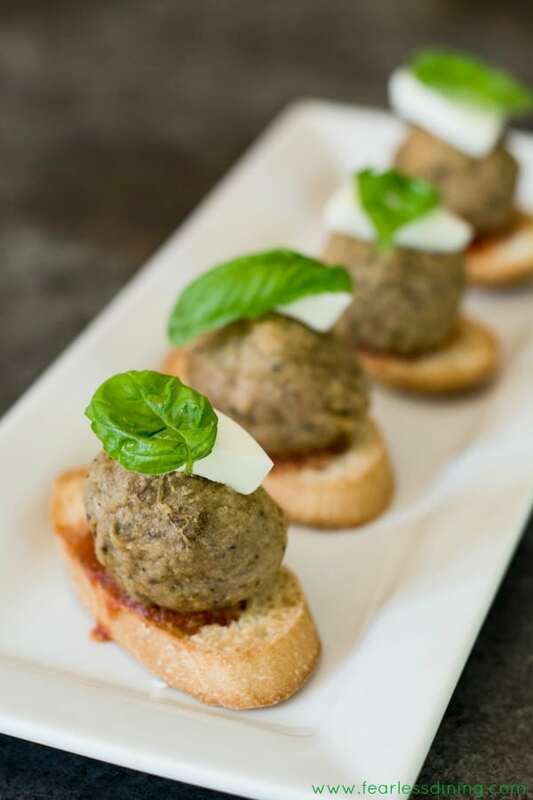 Grab a gluten free baguette and give this bite-sized Italian Meatball Crostini a try! Gluten free crostini topped with marinara, a Coastal Range Organics Chicken Meatball, fresh mozzarella, and basil. These are a popular treat for game day! You will also love that you can make this in under 15 minutes! Here is another angle to show you how pretty these crostini are for a buffet table. Next up is a delicious BBQ appetizer. Just drizzle your favorite barbecue sauce and top with a sweet fresh pineapple chunk! As I mentioned before, all of these party snacks are made with Coastal Range Organics Chicken Meatballs. *If not everyone in your house is gluten free, I would suggest the Coastal Range Organics Chicken Nuggets, Buffalo Wings, and Crispy Strips. 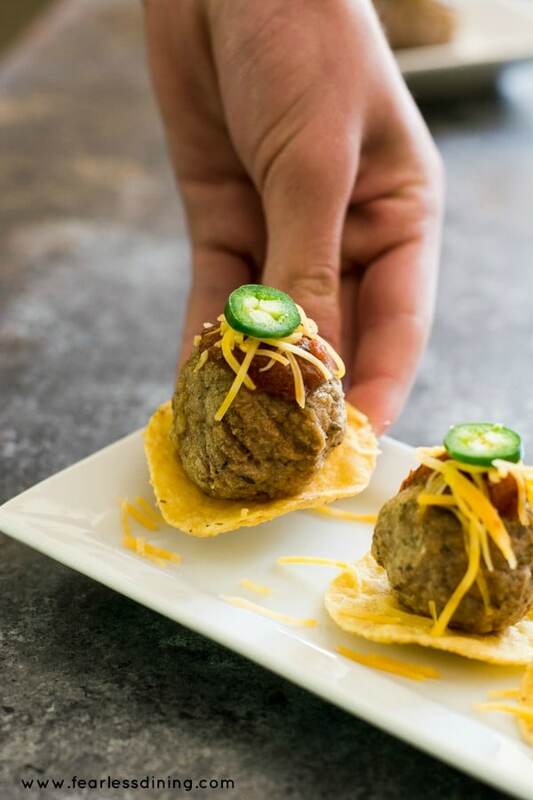 If you love tacos, this Taco Meatball appetizer will be popular. Top a corn tortilla chip with an organic chicken meatball, salsa, cheese, and a jalapeño slice! Drizzle this aged balsamic directly onto your Coastal Range Organics Chicken Meatballs. It is a delicious appetizer that is ready in about 5 minutes! All of these products are located in the freezer section of your grocery store. Their organic chicken products are nutritious and they make a delicious healthy snack. (Just ask my teen son who was able to devour two Organic Chicken Burgers in just one sitting!) Even my picky one ate one! 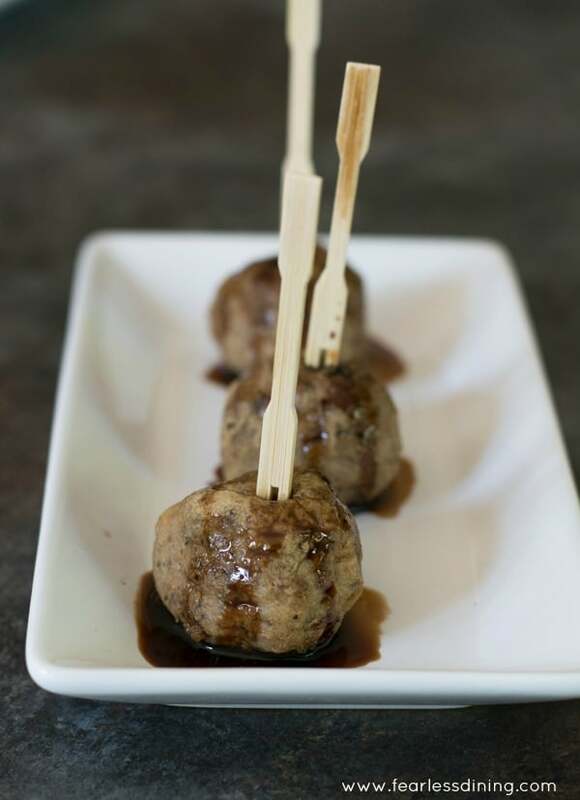 Here are even more delicious Gluten Free Meatball Appetizers if you are having a party! 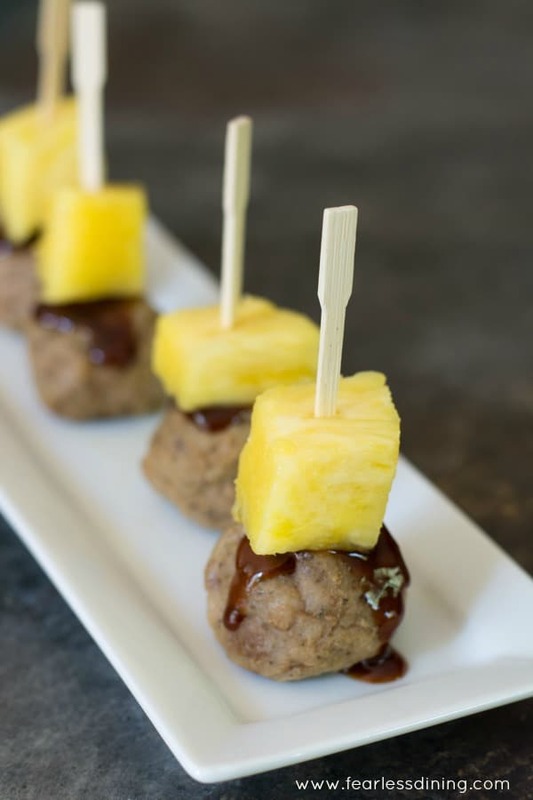 How to use frozen chicken meatballs to make four different appetizer recipes for game day, or any party. Heat the meatballs in the microwave per package instructions. For taco meatballs: Add one meatball to a tortilla chip. Top with salsa and cheddar cheese. Jalapeno slice optional. For Crostini: Slice a gluten free baguette in thin slices and toast. Top with a teaspoon of marinara sauce. Add a meatball, fresh mozzarella, and basil leaf. For Barbecue: Take a toothpick and add a pineapple chunk. Next add a meatball. Drizzle barbecue sauce on. For Balsamic: Take an aged balsamic vinegar. Aged vinegars are thick and sweet. 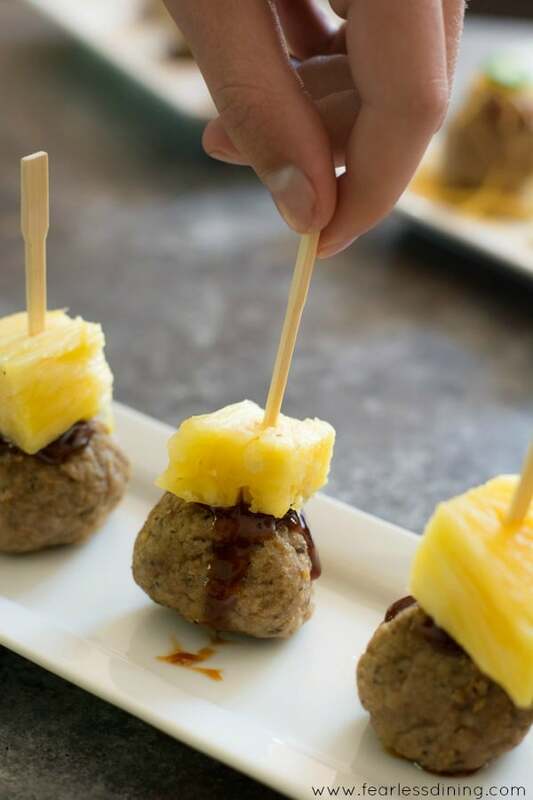 Drizzle onto a meatball and add a toothpick! You’ve dressed up these meatballs so creatively, but each option is uniquely delicious. So smart! Great options for holiday parties – thank you!! I never tried Chicken Meatballs. This is a great alternative from beef. I don’t eat pork so I usually have beef meatballs. I will try this with pasta too. I hope you like them Susie, they are very flavorful and they have a lot lower fat than beef meatballs. Such options are life saver when I have ton of work and guests are coming. Thanks for delicious recipe idea, Sandi! Loving it! Sandi, great post! I love it that we get four ideas in one swoop. I would gobble any of these down any time. YUM…thanks for sharing! I couldn’t believe how good these meatballs are Traci…and organic so I don’t feel like I am serving processed junk food. Loving all these ideas but am particularly drawn to the pineapple meat balls! Thank you Camilla, those were my son’s favorite too! I love that these are beautiful but also fast! Perfect! Speedy is perfect for drop in guests! I’m unfamiliar with this brand. Love how versatile some pre-made products can be. I’ll be on the lookout for this, I bet they’d be delicious in soup!